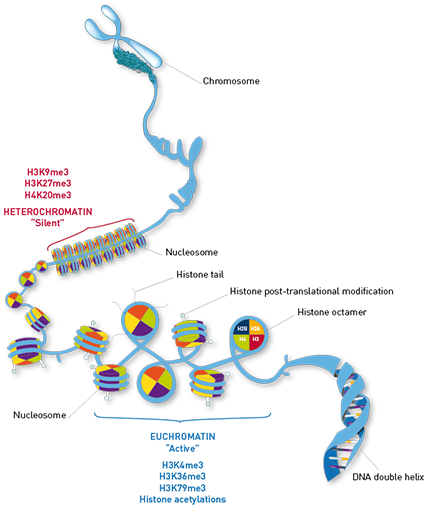 Histones are the main protein components of chromatin involved in the compaction of DNA into nucleosomes, the basic units of chromatin. A nucleosome consists of one pair of each of the core histones (H2A, H2B, H3 and H4) forming an octameric structure wrapped by 146 base pairs of DNA. The different nucleosomes are linked by the linker histone H1, allowing for further condensation of chromatin. The core histones have a globular structure with large unstructured N-terminal tails protruding from the nucleosome. They can undergo to multiple post-translational modifications (PTM), mainly at the N-terminal tails. These post-translational modifications include methylation, acetylation, phosphorylation, ubiquitinylation, citrullination, sumoylation, deamination and crotonylation. The most well characterized PTMs are methylation, acetylation and phosphorylation. Histone methylation occurs mainly on lysine (K) residues, which can be mono-, di- or tri-methylated, and on arginines (R), which can be mono-methylated and symmetrically or asymmetrically di-methylated. Histone acetylation occurs on lysines and histone phosphorylation mainly on serines (S), threonines (T) and tyrosines (Y). The PTMs of the different residues are involved in numerous processes such as DNA repair, DNA replication and chromosome condensation. They influence the chromatin organization and can be positively or negatively associated with gene expression. Trimethylation of H3K4, H3K36 and H3K79, and lysine acetylation generally result in an open chromatin configuration (figure below) and are therefore associated with euchromatin and gene activation. Trimethylation of H3K9, K3K27 and H4K20, on the other hand, is enriched in heterochromatin and associated with gene silencing. The combination of different histone modifications is called the "histone code”, analogous to the genetic code. Diagenode is proud to offer a large range of antibodies against histones and histone modifications. Our antibodies are highly specific and have been validated in many applications, including ChIP and ChIP-seq. Add H2A.Zac polyclonal antibody - Premium to my shopping cart. (50 μg) ChIP-qPCR ChIP-seq DB ELISA IF WB Affinity purified polyclonal antibody. Add H3K36me3 polyclonal antibody - Premium to my shopping cart. Add H3K4me1 polyclonal antibody - Premium to my shopping cart. (50 µg) ChIP-qPCR ChIP-seq DB ELISA IF WB Affinity purified polyclonal antibody. Add H3K9/14ac polyclonal antibody - Premium to my shopping cart. (50 μg) ChIP-qPCR ChIP-seq DB ELISA IF Peptide array WB Affinity purified polyclonal antibody. Add H3K9me3 recombinant antibody and negative control - Premium to my shopping cart.